With 26 years of experience, Protech is among the veteran companies in the field of pest inspection, regulation and control and insect removal from office spaces residents and commercial buildings. We have built an extensive knowledge of pests, their adaptive nature and nesting behavior through research and study. Our research and development team have come up with systematic procedures to completely eliminate unwanted pests from various kinds of properties. To serve you best, our pest controllers are a team of highly qualified individuals who have undergone extensive training in the field and holding HACCP certification. So, when you get in touch with our technicians, you can be assured to get a comprehensive understanding of the current pest situation in your home, along with a safe, effective and customized management plan to help secure your surroundings by eliminating present or possible future infestation. We carry out a thorough inspection of your home office and your surroundings for insects especially the one you call us for, including mites. We use the latest tools and technology to carry this out. Once our inspection is complete, we recommend the appropriate control solutions for the insects detected. 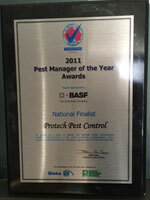 Our pest control service utilizes all-natural treatments and procedures to get rid of the insect problem. Our priority is to protect public health and in doing so, the environment in all possible ways. 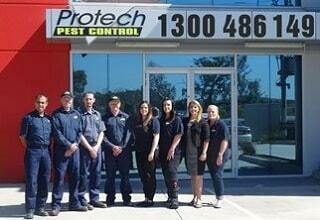 We guarantee 100% satisfaction for our Melbourne pest removal services. If the pests return, so do we - for FREE during our warranty period. When it comes to Food Safety Programs, we are backed and supported by the HACCP of Australia. Our work assures quality that is administered and executed by a team of expert insect controllers. 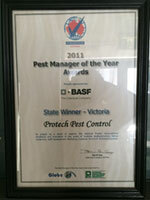 As one of the prime pest and insect removal service providers in Melbourne, we have set high standards for ourselves. Hence, our process of ongoing documentation of our findings, recommendations and services helps us cater meet your expectations as well. When it's a matter of insects and pests, we make sure that they stay out of your property so that you never have to second guess yourself when you just want to get back to the comfort of your home. Muzi is a renowned name in the industry with over 26 years of experience in Pest Control services in and around Melbourne. He has been instated as the official Competency Assessor for Pest Management in Victoria and instrumental in assessing the quality of pest control skills and services of his counterparts in the industry. Today Tonight carried a feature about him as an industry expert, and he has also shared some of his learnings in various industry food-training videos, publications and radio programs. It comes as no surprise that as the founder of Protech, he brings to the table an unmatched experience, a set of standards that have truly redefined the current industry trends with the use of innovative technology that is environment friendly and effective as well. Above all, Muzi believes in putting you first. That's why Protect is geared towards securing a happy and healthy surrounding for you.